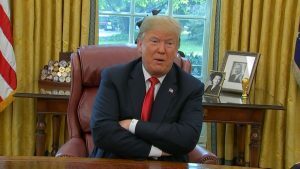 WASHINGTON, D.C. (NBC News) – With Hurricane Michael hitting the Gulf Coast and moving inland, President Trump says help is in position once the storm subsides. “We’ve got food supplies, food chains, we’re working with all of the states,” Mr. Trump said Wednesday. Among the biggest concerns: not enough people evacuated. “We are concerned that many citizens did not heed those warnings,” FEMA Administrator Brock Long said. “We are prepared with search and rescue teams to go in and try to do what we can. The catastrophic storm comes just weeks after Hurricane Florence slammed into the East Coast, flooding some of the same areas now in Michael’s path.